While most of our ATV trails are closed during the spring thaw, the Tuscobia Trail is ALWAYS OPEN, and well as any ATV road routes. Now is a good time to explore Sawyer County! or CLICK HERE to request your FREE trail map! Visit us at www.atvhayward.com for more information. The Hayward Lakes Area of Sawyer County in Northwestern Wisconsin is a popular year-round vacation destination that has become a favorite with ATVers in the know. With an inviting small town atmosphere, Hayward makes ATV vacations easy and fun. The area offers hundreds of miles of brushed and groomed trails. There are twisting, curvy trails for wicked turns and hills and valleys for hair-raising descents. Combined, this “pleasure potpourri” satisfies virtually everyone’s definition of a perfect ATV riding experience. Come take a wild ride in the wilderness. Trail info-The Hayward Lakes Area of Northern Wisconsin is blessed with very challenging ATV trails. A growing number of enthusiasts have made this area one of the top ATV destinations in Wisconsin and the Midwest. For the ATV and motorcycle enthusiast, the Chequamegon National Forest contains over 140 miles of trails. Three separate trail systems with adjoining loops, offer an exciting scenic tour of the Forest. Trails wind over rolling terrain, with towering forests and panoramic views of meadows and wetlands. 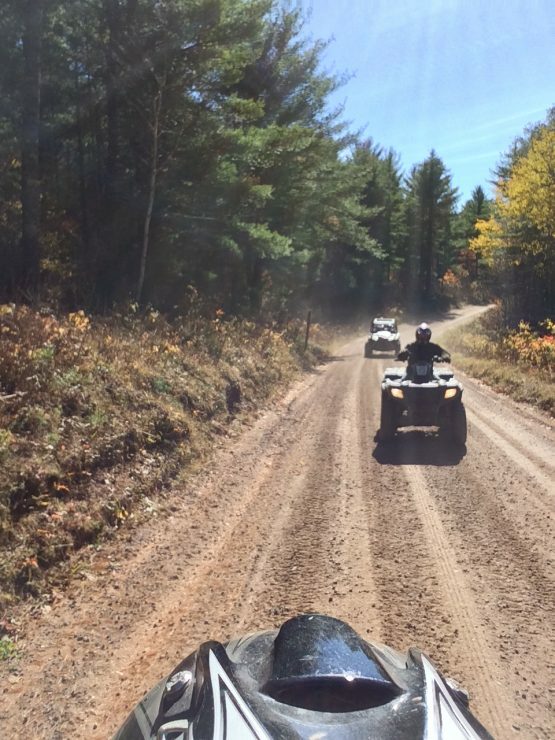 Unique to the state of Wisconsin, the forest’s ATV trails offer an unparalleled touring experience of the Chequamegon National Forest. 1) Seeley Hills Loop: Trailhead is at the fire tower off Hwy. B – approximately 3 miles east of the junction with 27. It’s on the north side of the highway and there is parking available. Another trailhead at Hayward Power Sports, 10 miles east of Hayward on 77. Approximately 30 miles of marked trials extends from the trailhead toward Seeley. For more information, contact the Sawyer County Forestry Department, P.O. Box 880, Hayward, WI 54843 or call 715-634-4839. 3) Flambeau River State Forest: 40 miles of trails through the forest, open May 15 – November 15. Trailheads on County W, 1 mile west of Connors Lake, Tower Hill Road, just north of W and Fisherman’s Landing on County M. Contact Flambeau River State Forest at W1613 County Road W, Winter, WI 54896 or call 715-332-5271. 4) Tuscobia Trail: From Birchwood to Park Falls, on an abandoned railroad grade. Camping available halfway along trail at Ojibwa Park. Trail is open from April 15 to November 15, and opens to the Dead Horse Trail north, the Flambeau Trail south. Contact DNR Ranger Station, P.O. Box 187, Winter, WI 54896 or call 715-266-3511. 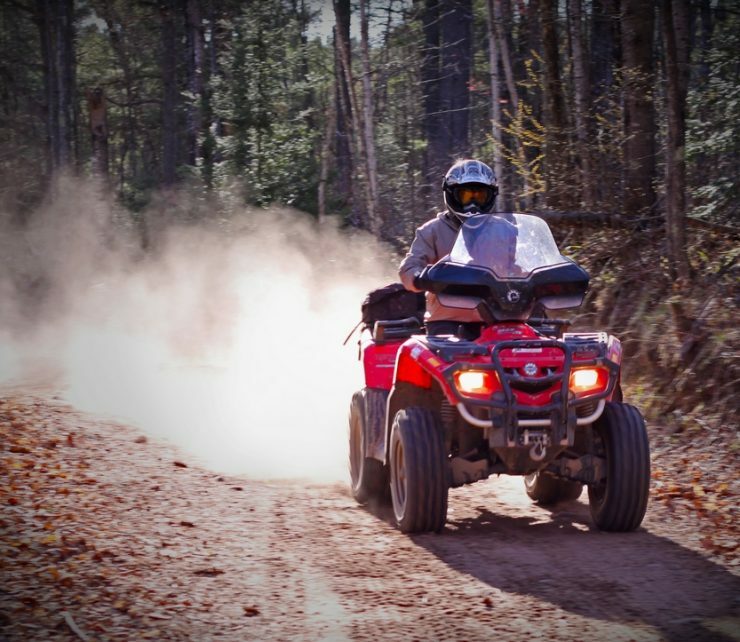 The Chequamegon National Forest currently provides for unlimited ATV access to national forest land – unless roads and/or trails are signed, bermed, gated or posted closed. Areas designated as wilderness or semi-primitive are non-motorized and illegal to operation of ATVs. The 30 townships within the Chequamegon each have their own rules/laws concerning forest roads which are maintained by the townships. Townships have jurisdiction over maintenance and law enforcement and decide whether the road will be legal for ATV travel, in which case the road must be posted with route signs. Forest roads that are NOT maintained by the townships, and are NOT posted as “closed” are legal for ATV use and do not have to be signed. For more information, contact the Chequamegon National Forest at P.O. Box 896, Hayward, WI 54843 or call 715-634-4821. Sawyer County ATV Policy: ATVs are not allowed off road on self-made trails through the timber or lowland areas. ATV’s may travel on snowmobile trails, fire lanes, logging roads, and trails that are not specifically closed to ATV’s or other motorized travel. Closed trails are: The Birkie Trails and marked hunter/walking trails. ATV’s are not allowed to travel on snowmobile or other trails that cross privately owned property unless the trails are marked as an ATV trail or the operator has permission from the landowner. Stay on marked ATV trails/routes – just because snowmobiles use certain trails, it does not make it legal for ATV’s. If you don’t know if the trail is legal, don’t use it. Click Here to see where Hayward / Sawyer County, WI is located.